Thanks so much to Pauline for today’s epic guest post, which we will let speak for itself. My name is Pauline Ward. I used to be a fervent Labour Party activist, and for just over two years I was a Labour Party employee, as a full-time researcher in the Scottish Parliament (2007-2010). This is the story of the political journey I made to Green politics and to the cause of Scottish independence. A couple of years ago, while I was working for a charity, I started studying economics and sociology and history with the Open University (I was a scientist originally). It opened my eyes in many ways, at a time when I was enjoying the intellectual freedom of no longer being a Labour employee. It made me think about what a nation is. I learned about the way the nation states we find in Europe today were mostly born in the nineteenth century, as the manifestation of the shifting allegiances of ordinary people who had rejected the old royal rulers and ties of religion. The borders of the new nation states crystallised around the nations which people felt willing to defend with their lives. And this made me realise how I felt about the idea of Scotland having full fiscal autonomy: basically, that would not be enough for me, because I wanted the people of Scotland and the leaders they alone elected to have the final say on when and whether Scottish service men and women would be sent to fight in any war. I had been opposed to the Iraq war. In fact, I’d actually exiled myself from the Labour Party for two years in protest over it, something which was very hard for me, given the party was like a second family to me. And at the time I did not see Iraq as a UK war imposed on Scotland – indeed, the polls told a different story. Rather, it was a war predicated on paper-thin excuses, driven through in spite of vehement opposition right across the UK, and at great political cost to Tony Blair and Labour as it turned out. But looking back now, I see that the parties elected in Scotland were more opposed to the war than those in the rest of the UK. And if Scotland had already been independent, whichever party was in power, I believe we would have sat that one out, because I don’t think our parties had an appetite for it. And then in January 2012 Johann Lamont, my former colleague, a very intelligent woman, a nice person, newly-elected as leader of the Labour Party in Scotland, started calling publicly for the referendum to be held early. Get it over and done with. I was disappointed. I had voted for Johann to be leader because I knew she would put the emphasis that I wanted on economic equality for people living in poverty and for women. But I had also felt reassured by the noises she’d made in the media about the independence debate during the leadership campaign: she had promised to be accepting and respectful of the decision if the Scottish people wanted independence. Johann had sounded like she understood that the SNP had a point. So I wasn’t expecting what seemed like a point-scoring exercise: it just seemed to me that she was calling for an early vote because of the polls showing a likely No vote, and because she wanted to rub the SNP’s noses in it; this didn’t feel like a more respectful, accepting debate. And I started to feel very uncomfortable about the idea of continuing to pay membership dues into this Labour Party that was going to spend the next two years primarily arguing bloody-mindedly against something I believed in. Johann had been in that Parliament at lot longer than me, listening to the nationalists quite often winning the argument: if Scotland was independent, we could make our own decisions about all sorts of things; we had more than enough resources to maintain levels of public services and so on. The sky would not fall in. In my two years working in the Parliament, I didn’t think too much about the independence question. My job was to support the Labour MSPs, on behalf of the taxpayer, to help them put forward the priorities they’d been elected to put forward. Which primarily meant social justice, and by that I mean combatting poverty and its pernicious effects. They were decent people, just human beings, these politicians – the 46 MSPs I worked for were genuinely there to try and make things better. But they were blinkered. I didn’t think too much about independence, and neither did they. When Labour For Indy appeared recently, I knew full well they would get no comfort from the MSPs because they are on automatic pilot as far as the constitution is concerned. They’ve painted themselves into an anti-SNP corner. I was instructed and trained in saying white whenever the SNP said black. And I think the Labour MSPs are a bit unrepresentative of the Party membership in that sense. If you were thinking about standing for Holyrood on a Labour rosette over the past couple of elections, you probably wouldn’t do it if you had strong doubts about the Union. So it’s a Unionist rump that remains in Holyrood. Maybe among Labour Councillors and other members we will hear more pro-independence voices as the referendum gets nearer. I hope so. I think that in their hearts the vast majority of the supporters of social justice in Scotland want to vote for freedom from Tory rule. That is a crucially important argument for me. Scotland consistently votes for more left-wing parties and politicians than the rest of the UK. But we keep on getting Tory governments that we never voted for. It’s happened in 8 out of the 18 Westminster elections that have taken place since 1945. The Union means that Scotland is ruled by Tories and LibDems right now. It means austerity. It means humiliating, badly-designed, badly-administered, downright cruel Work Capability Assessments for so many people with disabilities and diseases. It means the cruel Bedroom Tax forcing families out of their homes when there are no homes of the ‘correct’ size for them. It means our supermarkets and other businesses using Workfare to grind work out of our jobseekers unpaid-for, a brazen slap in the face of the minimum wage, a shameful contribution to cheaper grocery bills for the well-off. Every little helps. It means a real-terms cut to child benefit and families being fed out of food banks, and widespread in-work poverty. Why can’t we have an economy that works for everybody? Why can’t we have a country where work pays? Where all companies are not just expected but required to pay their taxes. And this is where studying economics comes in. Because I learned that there’s no reason we can’t have these things. We can choose governments that will re-wire the economy to do these things. But UK Labour seem to have lost the belief in themselves to make radical change to benefit the people at the bottom. Why is that? I think it’s because they need votes in the wealthy South East of England to get into power in Westminster. They can’t afford to have a politics that’s fully focussed on the kind of widespread poverty we have in Scotland. I’m from Clydebank (and on my mum’s side from a wee farm outside a petit village in France, and I grew up in Milngavie and Bearsden, and went to school in Maryhill). My grandfather and my great grandfather worked in the shipyards as engineers, back in the day when not all engineers had a degree. And when the German bombers came, in the Clydebank Blitz, our family was huddling together in the close, not knowing if they would make it through to see the next day, and not knowing whether their dad, my (great) grampa would be coming home from the yard ever again. I think successive Westminster governments abandoned people living in poverty in communities like Clydebank, and parts of Leith where I live now. The Union has not served them well. So I joined the Green Party. Here is a party that’s willing to make those radical changes to the economy to bring a better quality of life for everybody. Here are people who’ve read The Spirit Level and like me were delighted to find in its pages the evidence for what we’d been working for all along. It turns out societies where there’s greater equality of economic opportunity (e.g. Japan and the Scandinavian countries, compared to the UK and USA) are better off economically as well as healthier and happier. Here are people who not only accept that climate change is real but accept some responsibility and are trying to do something effective to stop it. The Greens are willing to stand up to businesses when they need to, to force them to take responsibility for their impact on the environment, among other things, they accept that there are both advantages and disadvantages to Scottish independence, and they understand and respect that all members will make their own judgment about that. And I’ve never looked back. 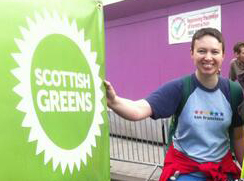 I’ve been a Scottish Green Party member for a year and a half now, and I’m very proud to be Green. I don’t think I’ll be tempted to go back, although I’ll always reserve the right to switch my vote on principle; I want politicians to earn it. So, to round this off, I would say that learning a bit more about how our country works (both from my studies and from being inside the Parliament, seeing change happen) made me realise how plastic our world is. Our politics, our economy, our ideas of what fairness is, these are all subject to fundamental change. They’ve always been changing, and in our digital-age-democracy they can and do change quicker than ever, because each of us has so much more freedom and power to communicate and therefore to influence. And I’ve lost my fear of Scottish independence. My history taught me that one of the things that kept us in the UK for so long was the vast range of economic opportunities the Empire offered, both in trade and in work in the colonies. That no longer applies, thank goodness. And my history taught me that powerful elites always ran the UK and made the rules to suit themselves. And they haven’t given up power willingly, it’s had to be wrestled from them. If you look around the world, you’ll see a great number of countries which used to be joined to the UK, as colonies or dominions. Not a single one of them is clamouring to get back in. Each of them is different, sure. But ask yourself when was the last time you heard anyone from Australia, or New Zealand, or the Republic of Ireland, or Jamaica, or Trinidad & Tobago or the USA or India, Pakistan or North or South Sudan, or Kenya wishing they could be part of the UK, wishing they could join us in a currency union, or asking David Cameron to command their armed forces. What all this boils down to is that I think independence will give our children the best possible future. A future where there’s more dignity and respect for people in different circumstances and from different backgrounds, and where everybody feels they have a say, and a stake, and a chance to make the best life for themselves. That’s why I’m voting Yes. This entry was posted on October 30, 2013, 9:25 am and is filed under Parties. You can follow any responses to this entry through RSS 2.0. Both comments and pings are currently closed. This is an epic piece in every sense. Pauline’s journey and conclusions on the rationale for Scottish independence conclusions are faultless… just bloody brilliant. Well, she is a Leither, so what can you expect :-0 This deserves to be shared and broadcast everywhere across #indyref social media and beyond ! Nice one, Pauline. I resigned as a member of the Labour Party decades ago but continued to help out at elections up to and including the devolution referendum. It genuinely never occurred to me that the Labour Party would be so institutionally anti-independence and the period between the last Scottish Parliament elections and now has been a bit of an eye opener for me. There must be a vast number of Labour Party members and supporters who reckon independence is the best chance for radical change to benefit people at the bottom you wrote about. I really hope they have the self belief to challenge the message from their party leaders, to vote YES on 18/09/14 and to encourage their peers to do the same. If you look around the world, you’ll see a great number of countries which used to be joined to the UK, as colonies or dominions. Not a single one of them is clamouring to get back in. I’ve heard this argument more than once from the Yes campaigners, and I don’t like it: it is appropriation. Not one of the countries that used to be part of the British Empire, whether as colonies or dominions, were ever entitled to elect MPs to the Westminster Parliament. Scotland is neither a colony nor a dominion. When Britain had an empire, Scots were among the colonisers and the empire-rulers. This “Yes Scotland” argument is deeply revisionist of Scottish history. If there are positive arguments to be made for losing our right to have Scottish MPs in Westminster, make them: don’t try to pretend they don’t exist. An excellent and refreshingly non-partisan article, Ms Ward. Thank you. If we vote for independence next year, you’ve certainly given me reasons for considering voting Green. EyeEdinburgh: I think you’ll find that Ireland had MPs in the Westminster Parliament prior to becoming an independent state. EyeE: You’re correct that the Irish Free State, as a dominion of the British Empire, did not send MPs to the Westminster Parliament. However, prior to that, as a constituent part of the UK, the territory of what’s now the Republic of Ireland did for a time send MPs to the Westminster Parliament. The entitlement to vote is a rather different question and the property qualification, not to mention discrimination against women, disenfranchised rather a lot of people in these islands until relatively recent times. Ah, you’re not interested in Irish Catholic disenfranchisement, then. Okay. I suppose MP’s have go fight independence, it will only lean to them joining the benefits queue. Wonder how many bedrooms they have? EyeE: Irish Catholic disenfranchisement under the UK is an interesting subject but it is not directly relevant to the matter of Ireland sending MPs to the Westminster Parliament before it achieved independence. The question is whether these MPs existed, not how they were elected, on which latter point I’m sure we can agree that it was not democracy as we now understand it. Thanks very much folks for *all* the comments, v encoraging & v interesting. EyeEdinburgh, you make lots of really good points. Wouldn’t want to be a revisionist for The Empire – in fact I did make the point myself that Scots profited from it economically, but not any more, at least not in the same way, thank goodness. But the comparison was about looking at Scotland’s future. All those countries when they made the step to independence established their own institutions: goverments, civil services & established independent economies, often with their own currency, in some cases establishing new currency unions. They’re moving forward on that basis. Scotland could do all those things successfully too, that’s my point. I should have said in my initial comment that you made a lot of very good points – I was also (am still) quite a bit narked by Scottish Labour’s reaction to the referendum, which the SNP had a very clear democratic mandate to hold. We haven’t had a referendum on full independence since 1979: one every 35 years seems about right to me, even if I’m a thoroughly undecided voter. But, comparisons between Scotland and British Empire colonies/dominions are invalid, as are comparisons between the largely-disenfranchised Irish Catholics of what became the Irish Free State and Scottish people today. We are not disenfranchised: we will be losing something if we go independent: and at the moment, as far as I know from what Nicola Sturgeon has said about the White Paper (in response to a question I asked her at Yes Leith a few weeks ago) the plan for indy Scotland is for us to have less democracy than previously, not more. All those countries when they made the step to independence established their own institutions: goverments, civil services & established independent economies, often with their own currency, in some cases establishing new currency unions. They’re moving forward on that basis. Scotland could do all those things successfully too, that’s my point. Yes, of course we could. The question is, why should we? Thus far, all the really successful arguments for voting Yes are negative and are being made by Messrs Cameron, Clegg, Miliband, et al, at Westminster. It’s refreshing to read a positive comment from a non SNP member as I feel it is important for voters to understand they do not have to support the SNP to vote YES for independence. There is a far greater chance of a Labour, Liberal or Green Party governing an independent Scotland than a united UK. @EyeEdinburgh; Lets take your(arguable, IMO) position that Scots are not, at present disenfranchised as read, and thus cannot be compared to the constituent parts of the former Empire which have gained their independence – what about the great many other nations which have become independent from larger wholes over the last century? Are Iceland clamouring to return to rule from Denmark? Are Finland and Norway itching to be reabsorbed into Sweden? Do Lithuanians demand that Russia take back control? I would say the argument in the article stands; nations which gain independence do not seek to return to their previous status as client states or regions, whether their independence was gained by popular vote or bloody uprising; whether it was gained from colonial overlords, monarchic unions, or geographical political entities. You ask “why should we?”, I would say the question is rather “why shouldn’t we?” – if we -can- run our own affairs, and we -can- have a successful economy, then what do we lose by doing so? We lose the political Union(and, it is my great hope, a few other things as well such as the monarchy), which as you point out does a fine job of generating negative arguments and nothing else, whether intentional and implausible scare-stories against the idea, or unintentional examples of their inept and uncaring nature in support of it. But you are correct to say that independence, in and of itself, does not gain us anything tangible either. What it does do is give us -opportunity- to gain things we otherwise would not have. Will we automatically have better regional autonomy and stronger local governance in an independent Scotland? Of course not, we gain the opportunity to fight for it and a much better chance of success. Will we automatically live in a more compassionate society? Well, I’d argue we already do to some degree, but again under independence we would have the opportunity to push for it to become moreso which simply doesn’t exist in the UK’s FPTP system where both major and the one significant minor party are all committed to the same neo-liberal austerity agenda. Take the time to look into two things; the Common Weal Project, and the Khan Academy – one a specific blueprint for a more just and prosperous Scotland, the other a fantastic reinvention and upending of the standard paradigms in education from an American former investment banker that has amazing outcomes, really explore the meat of them, and tell me whether you think we have a better chance of achieving such things as a medium-sized independent nation with a social democratic tradition and a proportionally representative parliament with full powers, or as a region within the fundamentally undemocratic UK electoral system that is increasingly beholden to American-style neo-liberalism and corporatism. I’m currently a very undecided voter, and neither Yes Scotland nor Better Together are at all helpful, but this evangelical attitude by Yes campaigners is never convincing. I say the question is “Why should we?” and refusing to answer that question just says there’s no answer. Reducing democracy in Scotland does not give rise to greater opportunities. We haven’t had a referendum on full independence since 1979: one every 35 years seems about right to me, even if I’m a thoroughly undecided voter. We haven’t ever had a referendum on full independence. Not sure if you mean to imply otherwise, but it sounds that way. Watsonlochlea, that means a lot to me, thank you and best of luck to you!